The hair is the richest ornament of a woman, said Martin Luther King and I can assure that no women will disagree with it. Indeed they spend a lot of time, perfecting, doing, managing this natural ornament of theirs, their crowning glory. Hair care in modern age is not mere a luxury but a mandatory practice for every one who do not want to lose their hair or least of all, mar/ underplay her personna, her looks with bad hair. No wonder, the market is inundated with plethora of products across the globe, across the life sciences including horticulture..right a product claims to use flower extract, other claims to use fruit extracts and a other claims something else. In such confusing time, of high marketing and banding, how will you know that which product is right for you? Off course, from "word of the mouth" i.e using the experience and feedback of people those who have almost similar type like you and faced similar issues as you do. Pie over the pudding is if they try different products and tell you one from the other, with the benefits and banes. 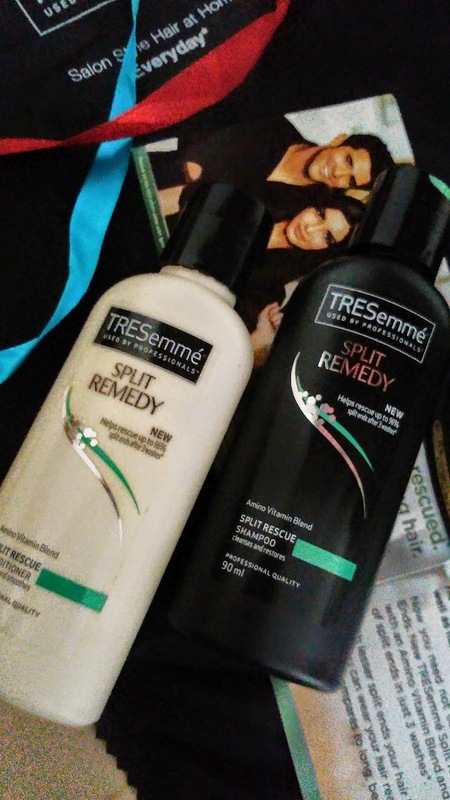 About the product- TRESemme Split Remedy shampoo& conditioner, genty cleanses and moisturizes hair making it look healthy and manageable while reducing split ends up to 80% after just 3 uses. The unique system, with an innovative "reconstructing" complex [TM] binds split ends- and with continued use, fixes damage as it occurs. 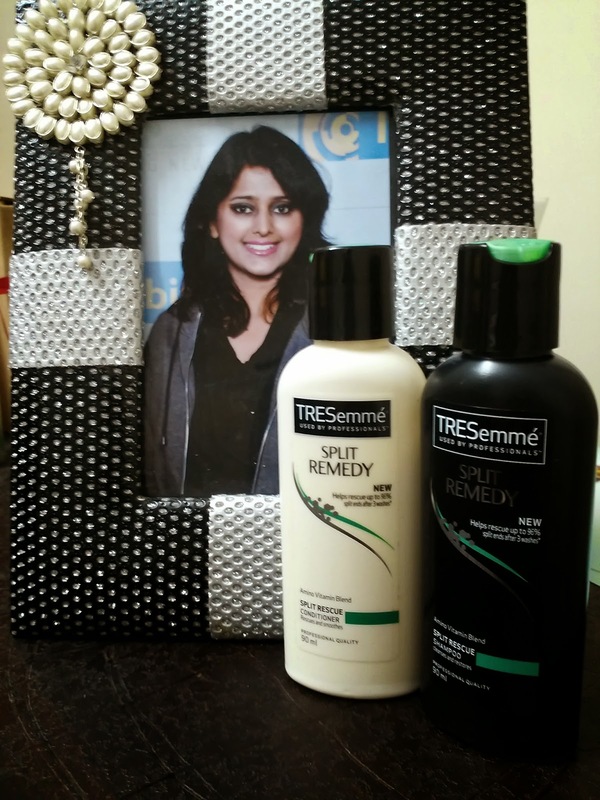 This hair care for split ends leaves strands looking Saloon fresh, soft, smooth and easy to style. What is a split ends and how is it caused? It is often caused due to harsh chemicals and roughness. SOmetime lasck of right diet and heavy stress. Traditional/ wide spread methods of treating split ends: Ages ago, women would lite a candle and run the flame over their single strands to try and stick n treat their split ends. You can imagine how effective could be that solution. Some like me, tied their ends in braids, post rigorous oiling leading to stained pillows. Some went for expensive treatments at saloon. Another most common way to treat split ends is- regular trimming. To which TRESemme suggested that "Your hair should have beautiful ends, and that endings should never be cut short." This is a chemical based shampoo and the key ingredients are- Amino and silicone among others [well placed on bottle] like water, Glycol Disterate, Hydrolyzed Keratin, Panthenol, Biotin etc. These ingredient form together to in a synergy to reduce the split ends. It formulates a soft coating on your hair post every wash to help bring the hair fiber together, reducing the friction between each and aligns them together to bring splinted ends into one. 2) The product is very mildly fragranced and hence good for hair. 1) The shampoo like it's other range, leathers well. However, it does not washes the oil completely in one wash and you need to wash it twice at least. Well that may be good thing but indeed that double application does not leave your hair harsh n rough is a good thing too. Do I recommend to others? May be yes but depending on their air type and nature of problem. 4) Drop a comment on this post suggesting your hair type and hair woes. In case, if you do not want the comment to be publicized, you can drop me a email and I will be happy to help you with a right product for your hair. Till then, happy blogging and yeah do shampoo twice a week, followed by conditioner.